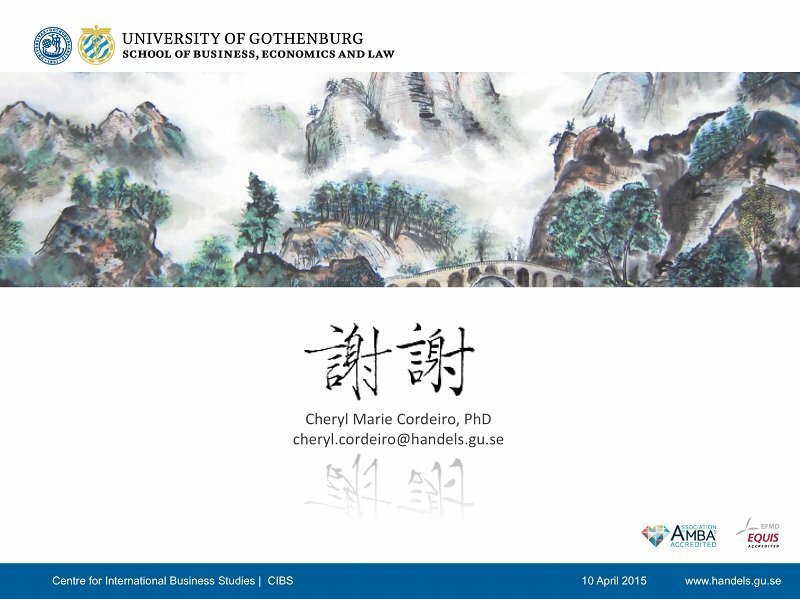 Presentation at the workshop, China’s Inward and Outward Foreign Direct Investments, on 10 April 2015, held at the Southwestern University of Finance and Economics or SWUFE in Chengdu, China. Language is involved with almost every aspect of human interaction. 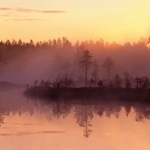 It is the medium in which thoughts are organized and communication proceeds. Language is a semiotic system of symbolic representation of meaning, meaning to say, we use language to convey meaning. As a tool of communication, language is double-edged in that it has both the ability to describe, while at the same time, circumscribe, reality. Language is also not static. 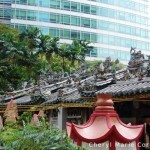 Its inherent characteristic in its multiple function is that it is a living entity. 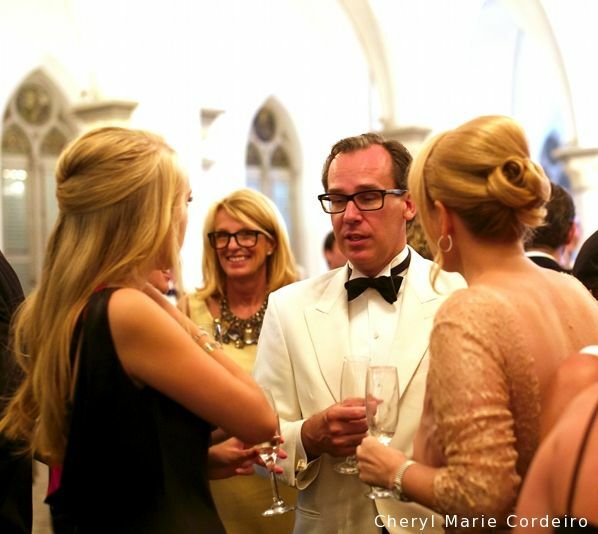 It evolves, as human nature and civilization evolves. 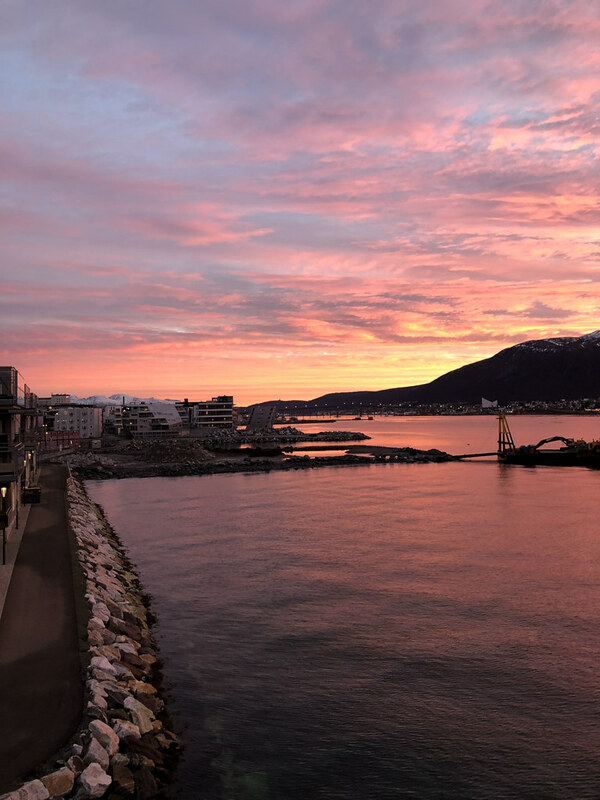 In the context of globalization and international management, organizations find themselves increasingly having to navigate the different language environments and their meanings. 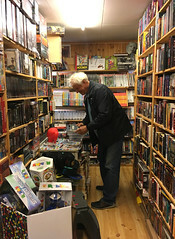 In the past twenty years in academic literature, language is increasingly acknowledged as being at the heart of international business (IB) activities. But few studies outside the field of sociolinguistics have studied language as used in a globalizing context in organizations. 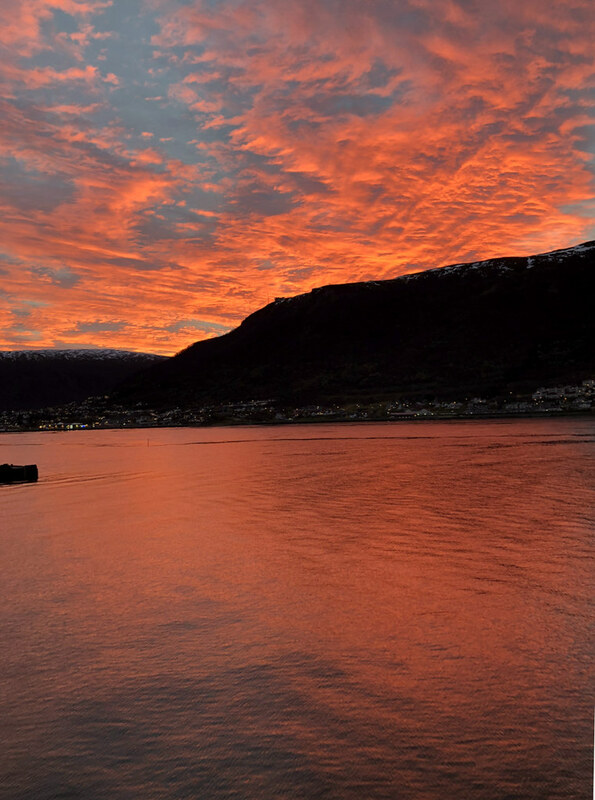 Meanings belong to culture, and not to any particular semiotic mode. In this picture by sports photographer Bob Rosato, taken at the Beijing Olympics Opening Ceremony in 2008, you can see the various strata of identities that China manages both within itself and outside of itself on a global stage. 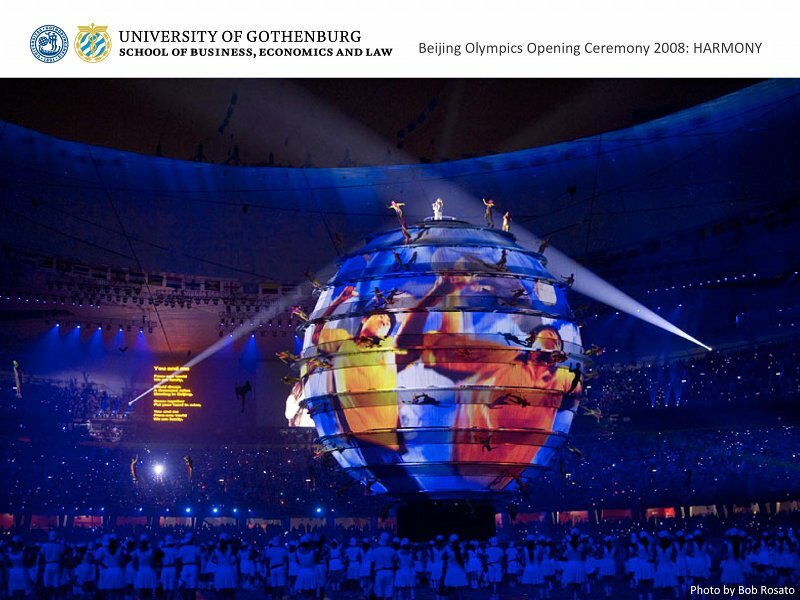 Watching the opening ceremony from 2008, you can see how the theme of Harmony was picked up and represented through China’s history, and then how that dialogues with global discourse, with global actors on scene – all very rich visually and symbolically. 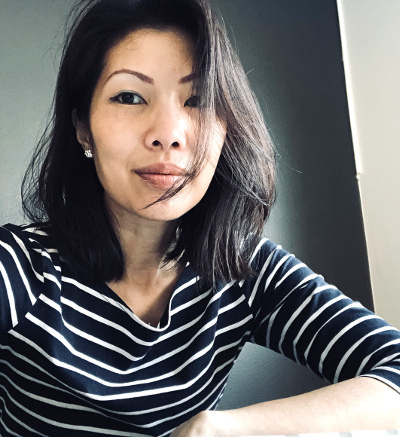 So you can study visual and linguistic representation as a reflection of how a particular group of individuals interpret their world experiences. And how they formulate it in their interactions, including organizational discourse. In that sense, the contribution of this study is a novel perspective on the reconfiguration of the global automobile industry. 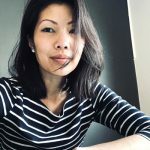 While most studies are quantitative, coming from the perspective of economics and international business or relations, this comes from a social semiotics perspective, set in the tradition of qualitative research methodology. 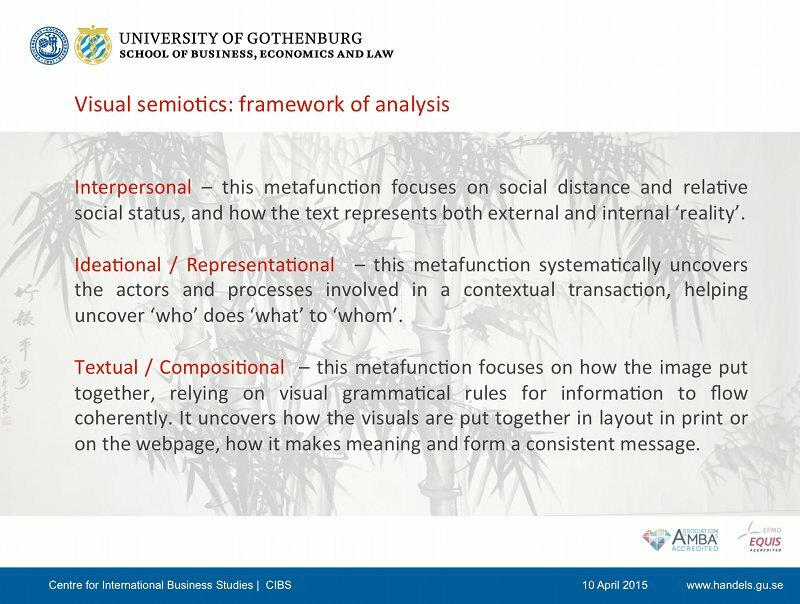 In this study, which uses visual semiotics as theory and framework in studying the globalizing efforts of a firm, language is taken in its broadest sense, to include both linguistic and visual representations, each consisting of its own grammar (rules of representation). This slide briefly captures what semiotics, and then visual semiotics refer to: that it is a semiotic system for the symbolic representation of meaning, describing and circumscribing a certain reality. 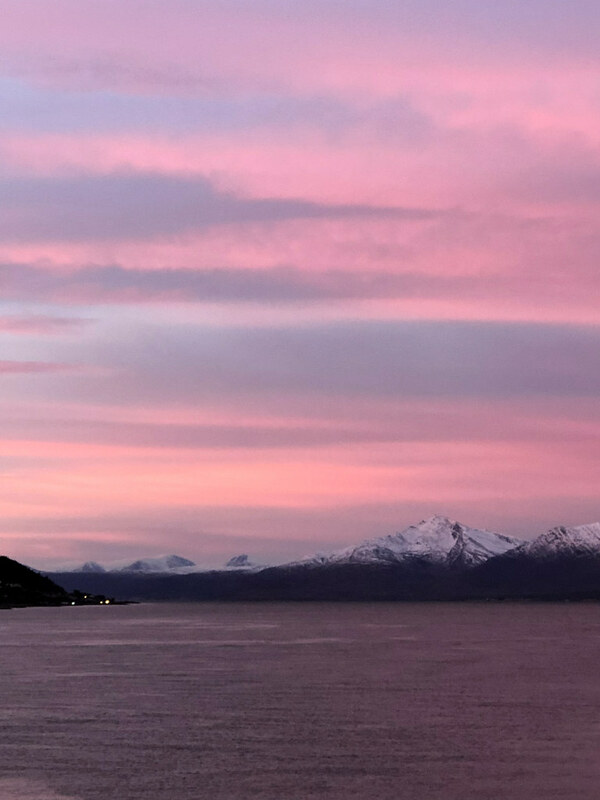 That it is used as a communication tool, and that meaning belongs to culture and that visual representations, like linguistic representations, come with a set of grammatical rules. This translates to that the sign can be said to be arbitrary, but the manner in which you use the sign is not. 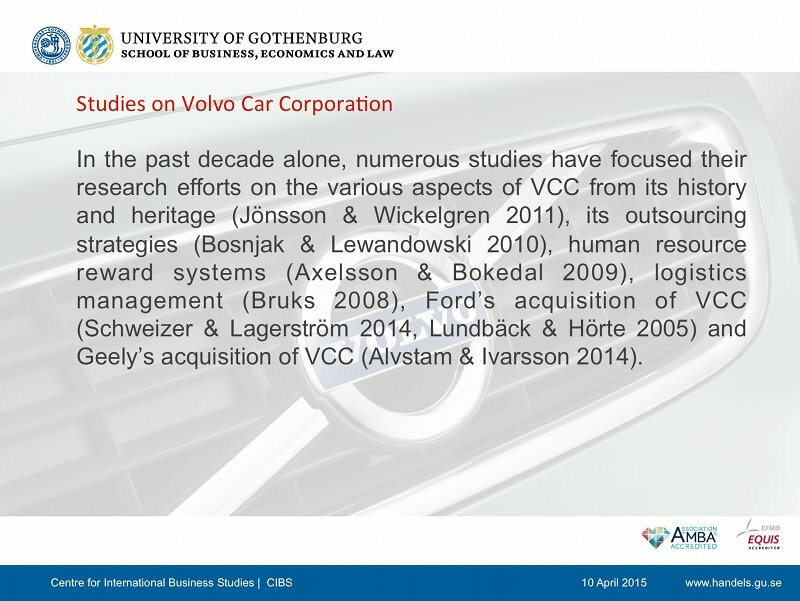 The specific example taken in this study as an example of an Asian-founded emerging market firm is the acquisition in 2010 of the originally Swedish company Volvo Car Corporation (VCC) by Chinese Zhejiang Geely Holding Group (Geely). 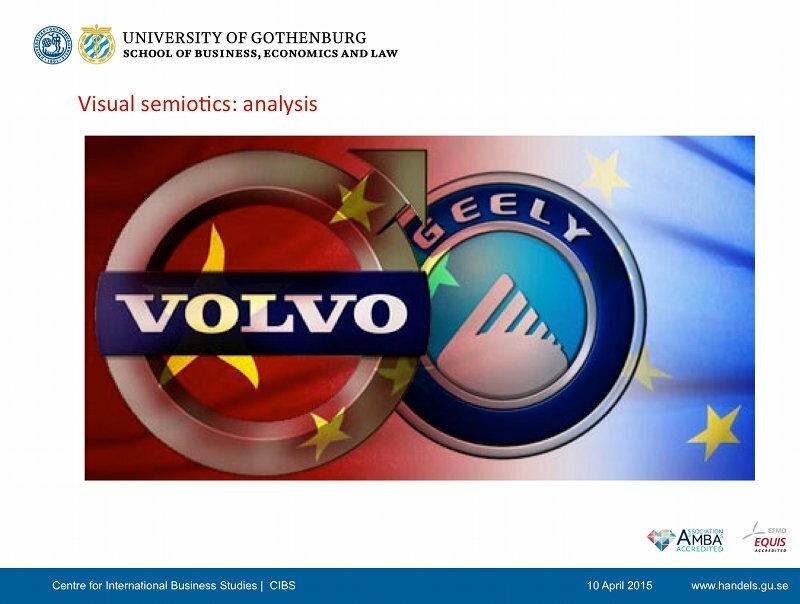 This study consists of a visual semiotic analysis of the globalization efforts of Geely, beginning with its acquisition of VCC. 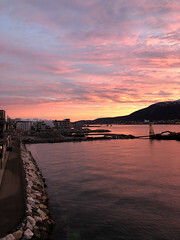 VCC is one of the most popular enterprises to study, especially for those in the region of Scandinavia. 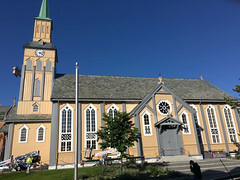 Various aspects of VCC have been studied, from its Swedish heritage, its outsourcing strategies, its human resource reward systems, its logistic management, Ford’s acquisition, its disquisition, to finally, its acquisition by Geely, And as mentioned, the perspectives are also varied, but most studies cluster around the disciplines of business administration, if not engineering and technology. 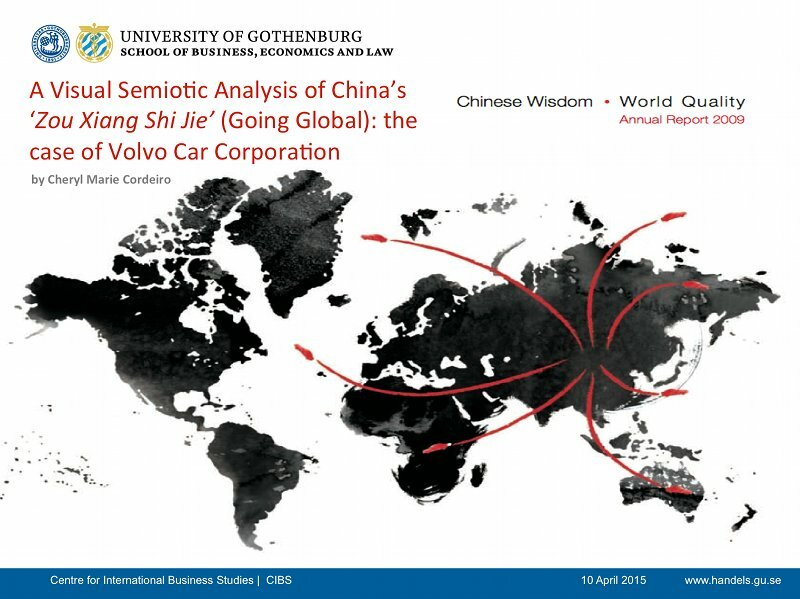 This study shows how visual semiotics can uncover and trace the ideological developments of China’s global ambitions in the automobile industry through its official corporate discourse. For this reason, corporate communication material from between 2007 and 2011 was chosen as data to this study. These are the years prior to and after Geely’s acquisition of VCC, with the negotiation for VCC falling between mainly 2009 and 2010. •	Geely’s official corporate communications in the form of printed annual reports from 2007 to 2011. This rendered a total of 629 of pages for analysis from the annual reports alone, the average number of pages per annual report between these years being approximately 126 pages each. •	Selected online and print news articles based on topic relevancy on Geely and VCC between 2006/7 and 2012. 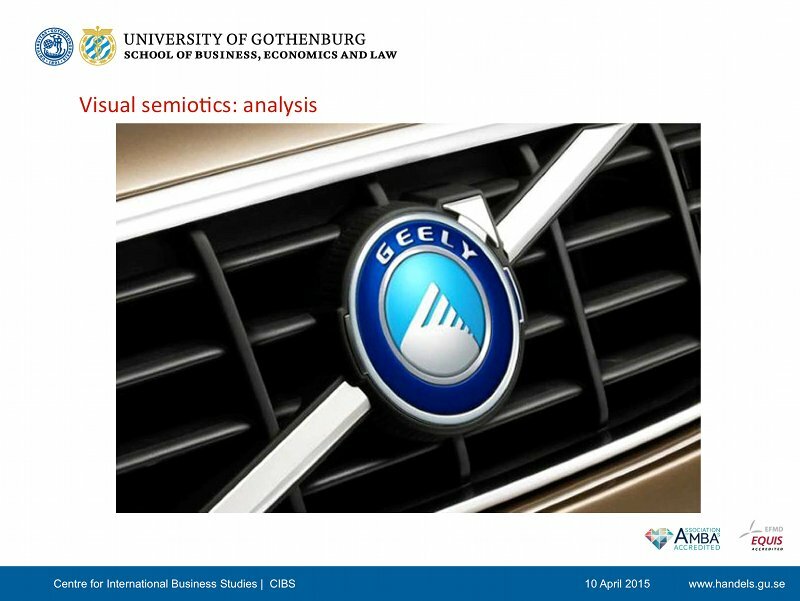 (i)	How can visual semiotics be applied as theory and framework of analysis to Geely’s global corporate ambitions? 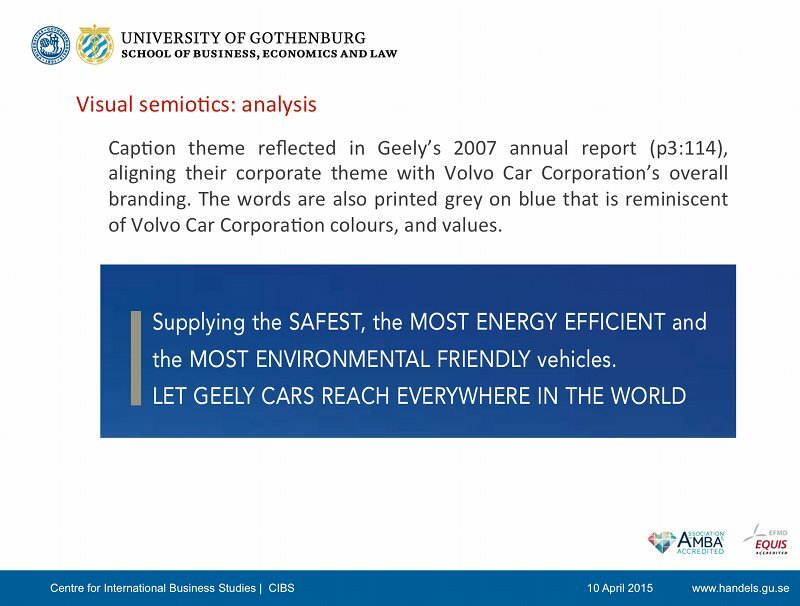 (ii)	What ideological developments can be revealed via the use of semiotics of Geely’s global corporate visioning and ambition? The framework used in this study arose from the schools of semiotics applied to linguistics. 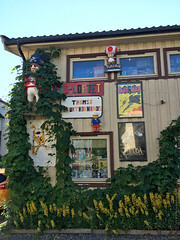 In particular the Prague School of the 1930s and 1940s. 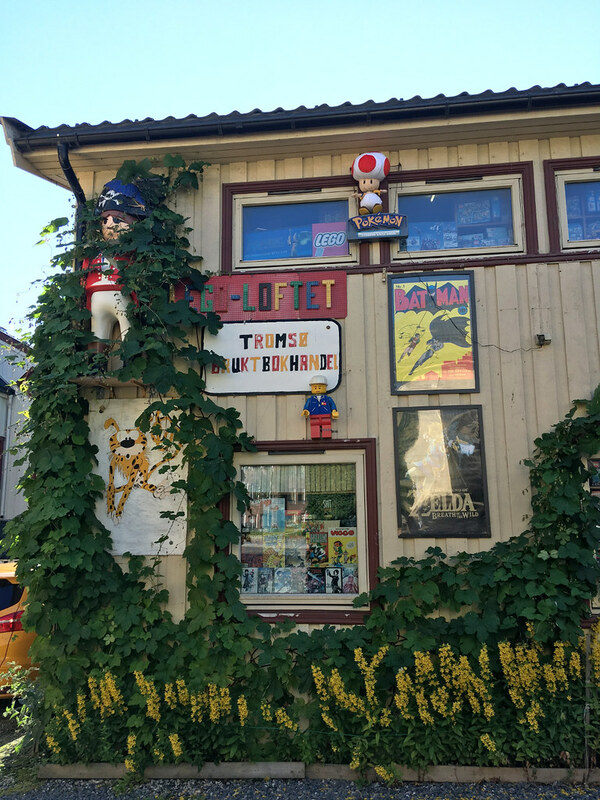 The most recent theoretical movements of substantial influence arose out of critical linguistics during the 1970s, focusing on semiotic systems in social practice. 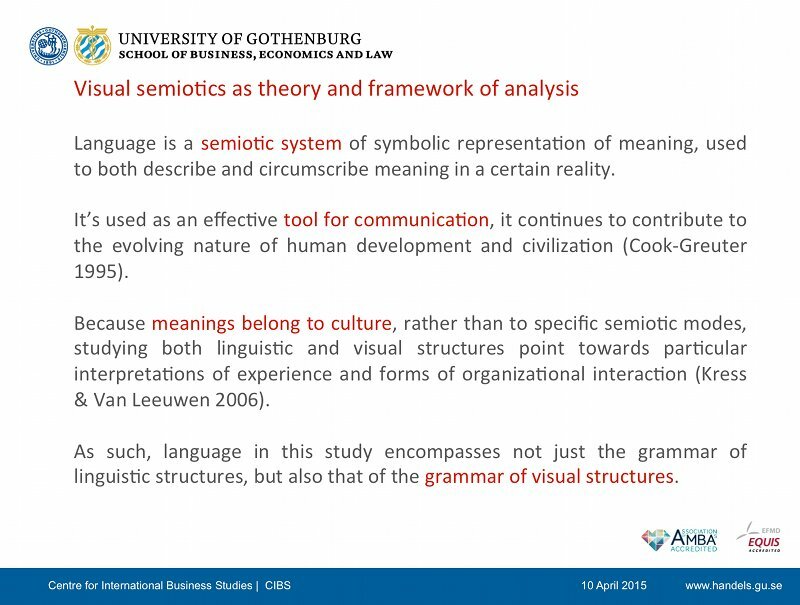 You can find this in the works of Michael Halliday in systemic functional linguistics, coupled with Kress and van Leeuwen, their works on visual semiotics. (a)	Interpersonal – discourse analysis at this metafunction focuses on social distance and relative social status, and how the text represents both external and internal ‘reality’. 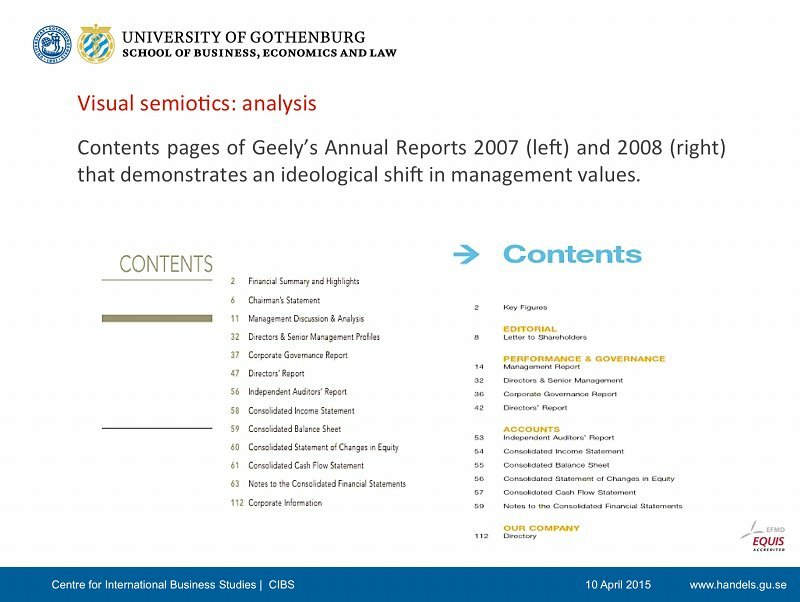 This aspect focuses on appraisal, positive or negative attitudes that help uncover and deconstruct for example, Geely’s social relations as an organization. 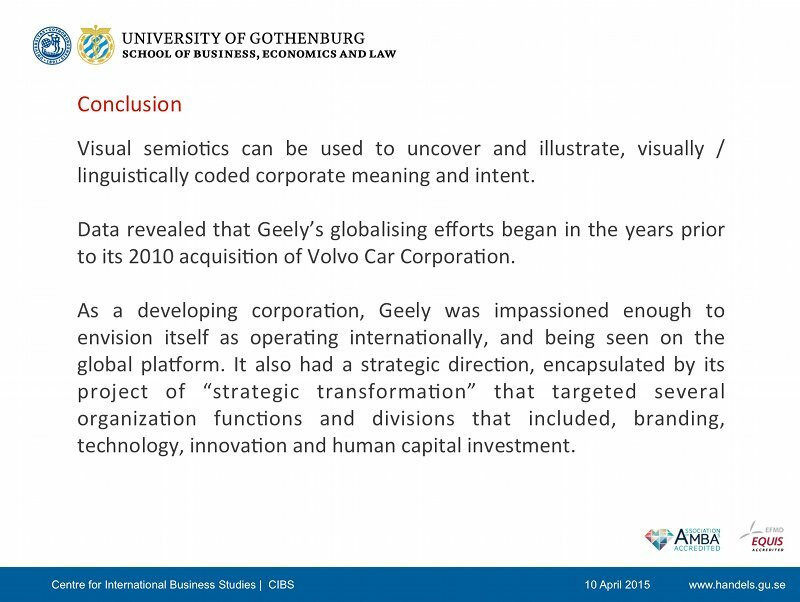 It helps uncover how Geely evaluates its relationships with other organizations or groups that are important for Geely in managing their own brand, tracking their evolving attitudes in their relations with their acquisitions as expressed in their use of language, in particular, VCC. 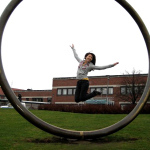 The interpersonal metafunction in visual analysis on the interpersonal metafunction is about the participants involved in producing and interpreting the image, also indicating what ‘reality’ might be perpetuated or deciphered by viewing the images used. It also uncovers the perspective of how the picture engages the viewer. The choice of pictures used in Geely’s annual reports for example has the capacity to immediately engage the viewer, while at the same time, convey an attitude towards its viewers, carrying with it a message from the organization / producer of the message towards its target audience. Social distance, gaze, angles of objects whether horizontal or vertical are features in an image that act to engage the viewer in the process of viewing and interpreting an image. (b)	Ideational / Representational – this metafunction in discourse analysis systematically uncovers the actors and processes involved in a contextual transaction, helping uncover ‘who’ does ‘what’ to ‘whom’. In terms of visual images, how objects are represented, whether in terms of vector spaces by distance measurements based on salience and prominence of an object represented, to how it is depicted conceptually or symbolically, all help transmit a certain organization ideology. Geely as an organization for example, is known in China to take active concern for its employees, where human capital, technological and innovation management for example are often highlighted in their organization discourse and likewise, can be expected to be reflected in images used in their corporate brochures, where participants are portrayed as actively contributing to the organization’s success. (c)	Textual / Compositional – in discourse analysis, this dimension focuses on how the text is put together, relying on grammatical rules, syntax and lexis for information to flow coherently. 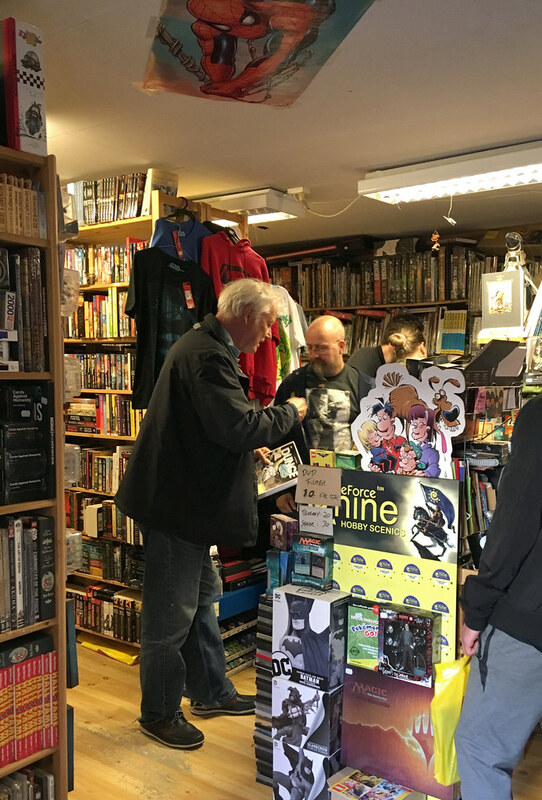 In visual analysis, compositional representations means to look at how the visuals are put together in layout in print or on the webpage, to form a consistent visual image. 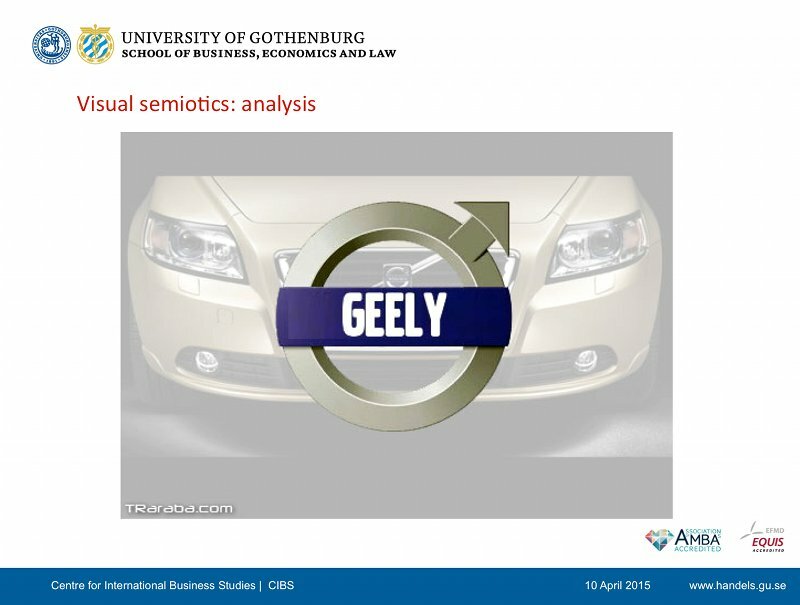 This aspect of analysis helps uncover consistent themes and strategies in for example, Geely’s use of images in their corporate communication, and how both discoursal and visual meanings are organized and emphasized so that both readers and employees in the organization can process or interpret the information. As an example of the interesting facets of ideas, opinions and ideology that visuals can express. Here are some examples of the visual representation using just Geely and VCC logos, at the time when Geely had announced its acquisition of VCC in the media. 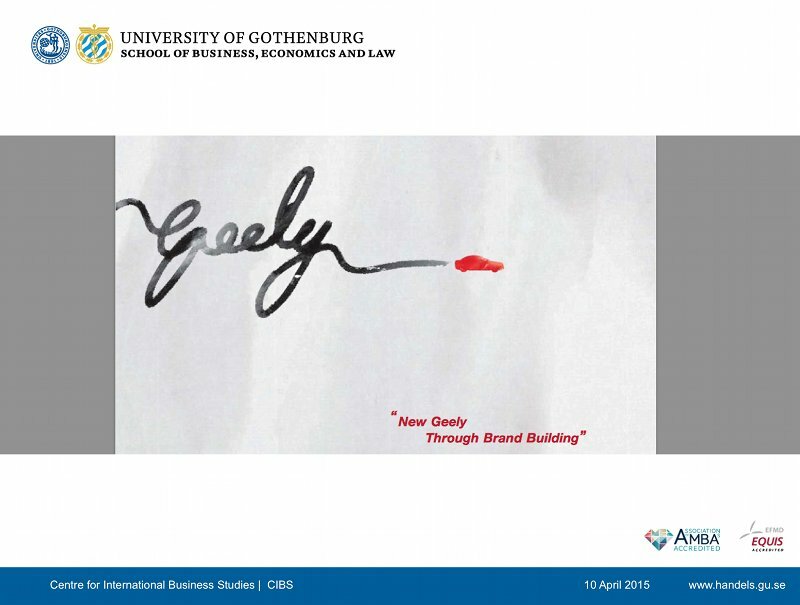 Slide 10 is from a branding company in Vietnam. 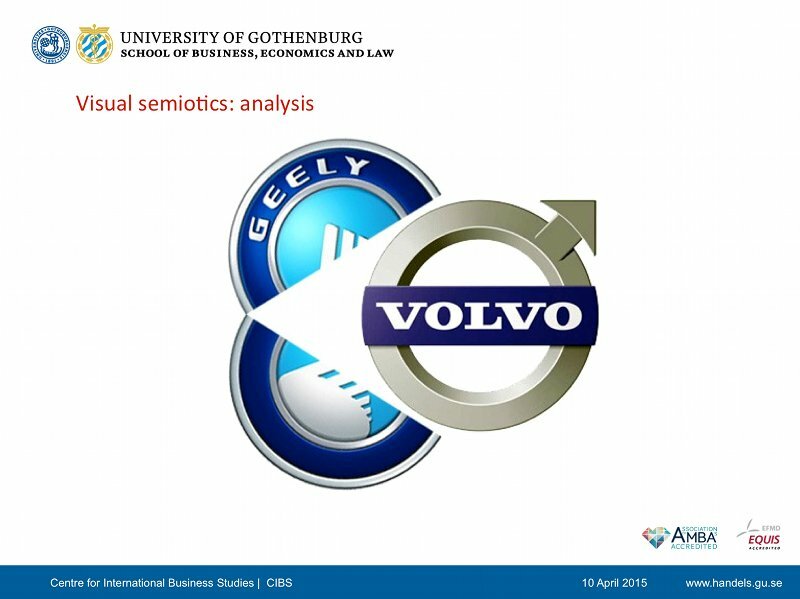 This was their representation of Geely’s acquisition of Volvo Cars. 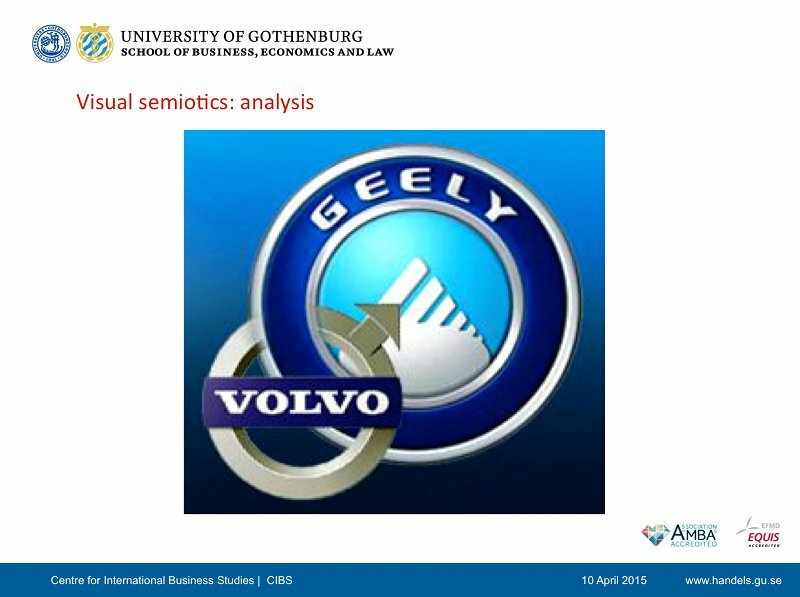 Slide 11, found on the same webpage, with Geely superimposed on a Volvo Car logo. 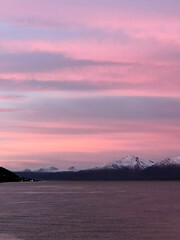 Slide 12, from MIBZ.com, an automobile information website. The caption to that visual reads, “Let’s hope this isn’t the new logo, it would be lamer than a pink Hummer”. What is interesting here is the switch in perspectives, with Volvo encapsulating Geely, which rather makes it look like Volvo Cars has acquired Geely. Slide 13, here, a symbol of marriage. You could read other interpretations into the joining of the two logos, the size of the logos depictured, what information is foregrounded or backgrounded and how the two logos are aligned to render the single visual. 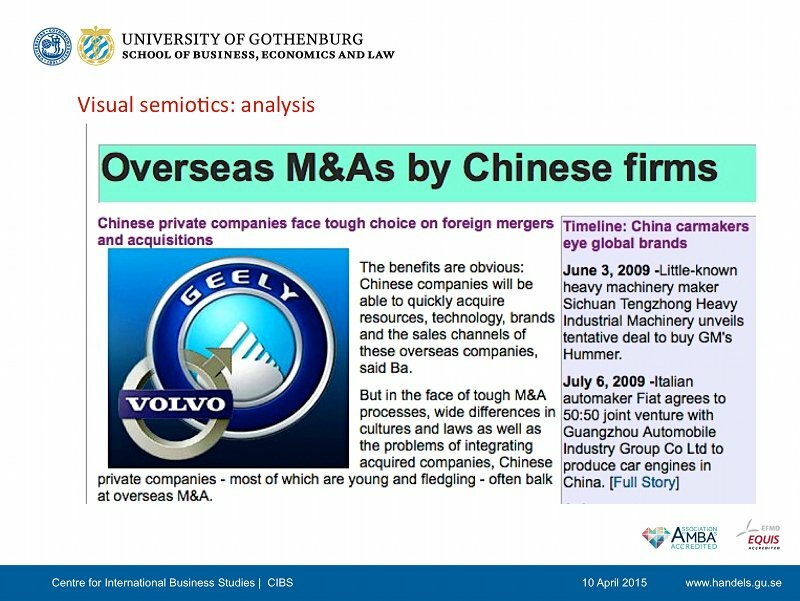 This comes from China Daily, an online news site, in a context when [SLIDE 14] overseas mergers & acquisitions by Chinese firms were prominently featured, and there was great interest in that topic in the Chinese news. In this visual, Chinese Geely is foregrounded in information, seeing to take Volvo Cars with it, the arrow pointing the readers’ eyes upward and towards the future (indicated linearly by “to the right”). Slide 15 is another rendition of the acquisition, from the website, South Africa Car Fan. Slide 16 is a personal favourite of mine, due to the nuances of underlying information. 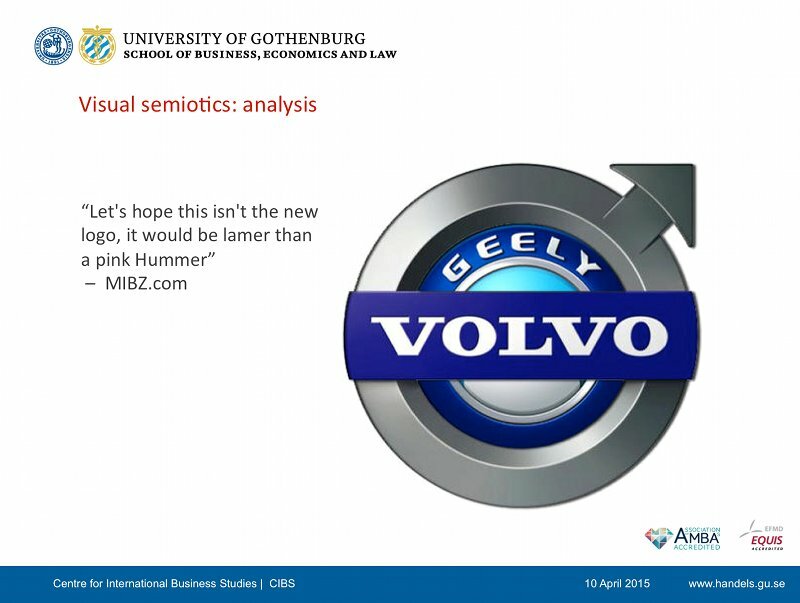 Volvo Cars is foregrounded by at the same time, in a position of “Given” information indicatd by being situated in linearity in the left side of the visual representation. Yet, the “given” information contains within it, new information, that of the Chinese flag in the background. So in effect, China is also foregrounded in the visual representation as “given” information, as the source of supply or energy behind Volvo Cars for the future, indicated as blue and yellow towards the right hand side of the visual (as “new” information). 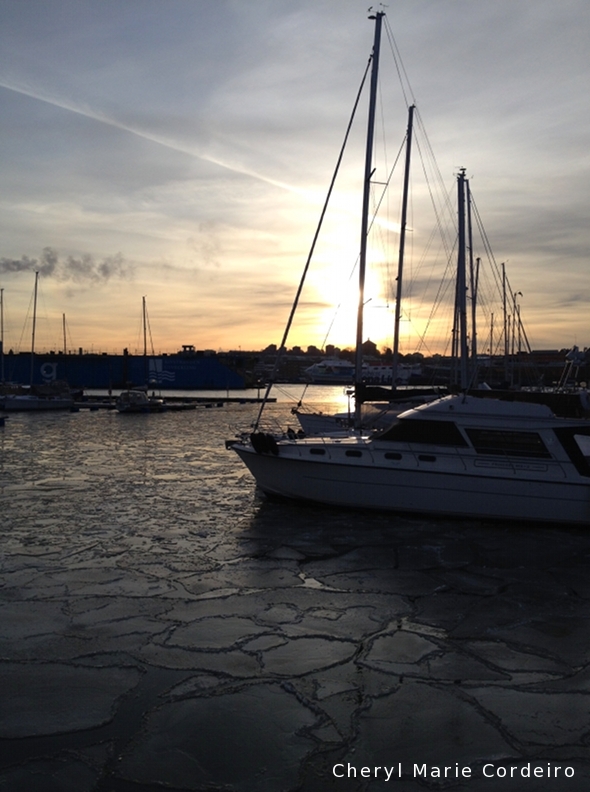 This visual comes from Red Ice Creations, a Swedish radio show in Gothenburg by Henrik Palmgren. With that exercise in mind, we can apply the same lens onto Geely’s official corporate discourse. From the 2007 annual report, before Geely’s acquisition of Volvo Cars, you can see an alignment of values with Volvo Car’s own corporate values. 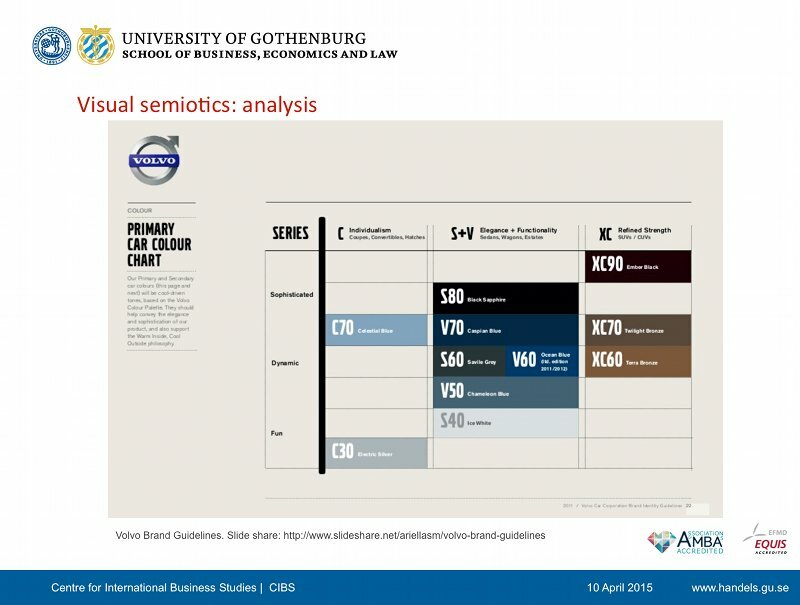 You might even comment on not just any kind of blue but reminiscent of the Ocean Blue that, [SLIDE 18] within the Volvo Brand Guidelines for cars, is used for a category of cars that denote elegance as well as functionality. And if you wonder about the internal structures of the organization, that was also changing rapidly in the years prior to the acquisition as reflected in just this Content Page layout between 2007 and 2008. Apart from the Swedish flag colours of blue and yellow, 2008 comes out not only as more structured, but also more open and outwards looking. 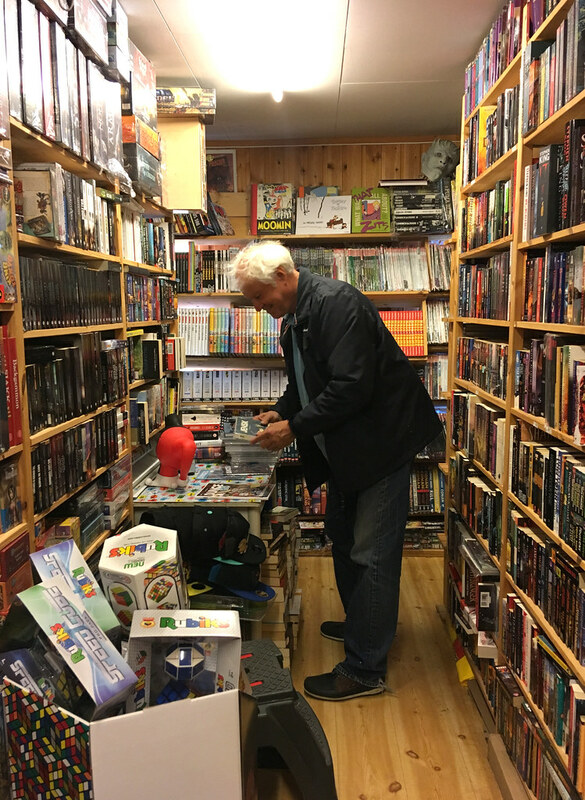 Compare for example “Chairman’s Statement” in a strict top down hierarchical approach, to “Letter to the Shareholders” which sounds friendlier, and more approachable as an organization. Also compare the more inward focused “Management Discussions & Analysis” to a more third-person objective, “Performance & Governance” heading, with ‘reports’ that give a sense of organizational duty and obligation to parties outside of themselves. 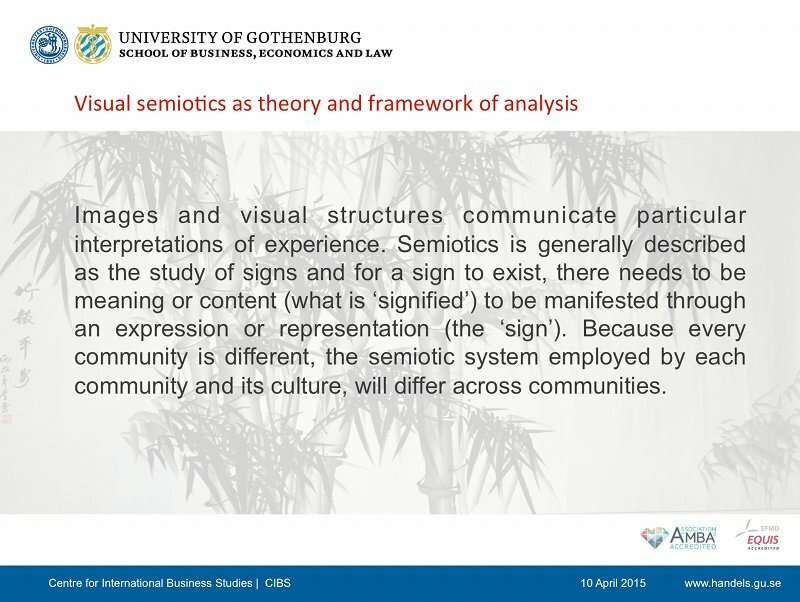 In conclusion, I’ve hoped to illustrate with this brief presentation how visual semiotics arising from the traditions of social semiotics, can be used as theory and framework in uncovering, analysing and understanding corporate ideology and ambitions. It can also show how passionate an organization is in setting their goals and how they go about achieving those visions and goals. 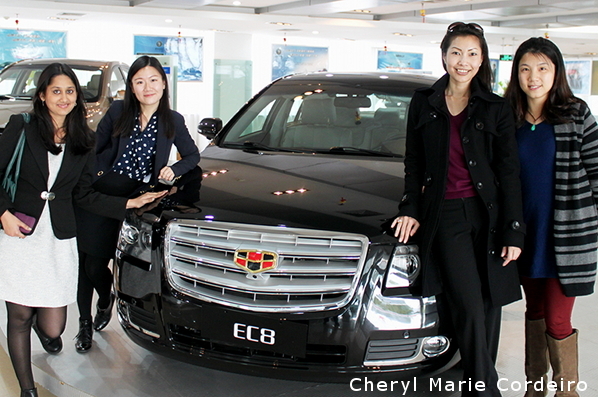 As a developing corporation, Geely was impassioned enough to envision itself as operating internationally, and being seen on the global platform. 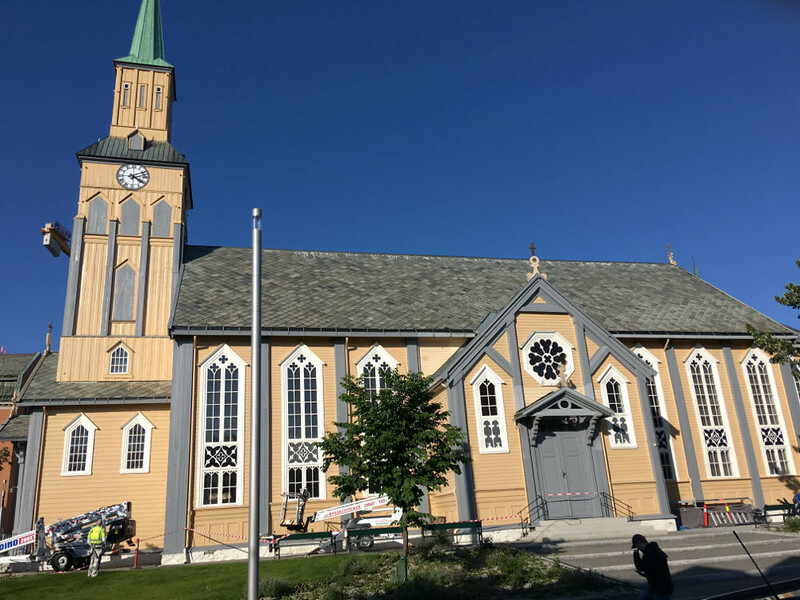 It had a strategic direction, encapsulated by its project of “strategic transformation” that targeted several organization functions and divisions that included, branding, technology, innovation and human capital investment. I’ll be happy to address any questions from the floor.